Choose one of our men and pray for him daily. You can find out more about each of our men on the Meet Our Seminarians page. Also check out our Spiritual Support page for prayer resources. Teachers – Have your class adopt a seminarian together and support him in prayer and with encouraging cards from your students. A great way to promote vocations as well! Make a donation to the Vocations Office (more information here) to help us to pay for their education, health insurance, and living expenses. 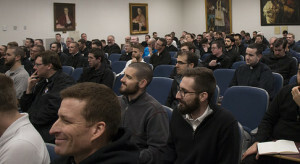 Make a donation to an individual seminarian (not tax-deductible). Our seminarians are grateful for any support they receive and this money goes towards the personal expenses they are responsible for. We do our best to make sure all of our men receive support equitably. If you are interested in donating to a seminarian or seminarians, please contact seminarian Nathan Davis using the form below and he will direct you as to how to do so.